Poach the chicken breast in enough salted water. When the chicken is completely cooked, remove from heat and allow to cool a bit, then shred. Heat the butter in a pan and sauté the chopped tomato. Add the garlic and sauté until the tomato is soft. Set aside. Peel the plantains and cut them into thick slices. Heat the oil and place the plantain slices in it. Fry plantains over low heat for a few minutes, until soft, and remove from the pan. Flatten the slices with a plate or a rolling pin and place them back in the hot oil. Remove the plantains when they are golden brown on both sides and immediately sprinkle with salt. To make the cilantro sauce, process the rest of the ingredients in a blender and taste for seasoning. Add more salt if necessary. 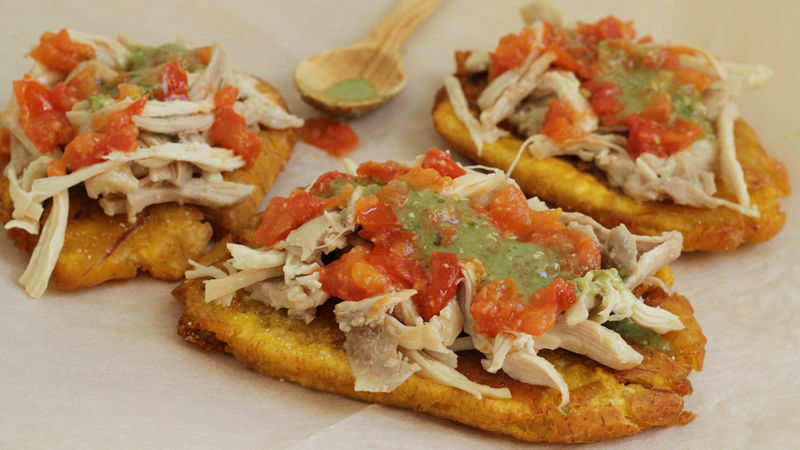 Top the fried plantains with the shredded chicken, the sautéed tomato, and lastly, with the cilantro sauce. Make extra servings of this delicious cilantro sauce and refrigerate to use as a salad dressing or for other dishes. Plantains and chicken, an awesome duo. This easy recipe for fried plantains is all the proof you need! You'll like it even more when you taste the delicious sauce. It's so flavorful you'll want to make extra so you can enjoy it with other dishes. Shred one chicken breast, add sautéed tomato and garlic, serve over the fried plantains and dress with the cilantro sauce. Doesn't it sound perfect?